Cultural anthropologist Sidney Mintz, prominent for linking English’s insatiable sweet tooth with the transformation of Britain from a hierarchical society to a democratic industrial society, succinctly summarizes the multi-century narrative of sugar in less than one hundred words. The introduction of sugar in the mid-17th century and the subsequent craving for sweetness catalyzed radical cultural and commercial changes within British society which evolved over the course of two hundred years an ultimately shaped British culture into its modern day social order. Although prior to the mid 17th century, sugar, limited by supply and expense, was primarily used as a spice, a medicinal supplement, and for both decorative and preservative purposes, sugar’s use as a sweetener ultimately prevailed. In 1662, Queen Catherine, King Charles II’s Portuguese wife, introduced drinking tea, a habit of the Portuguese nobility, to the British courts. An easily adulterated and ingestible beverage, the upper echelons of society quickly adopted the daily ritual of tea and soon began to add the newly available sweetener to the otherwise bitter beverage. (Mintz, 110) Tea quickly become symbolic of the wealthier and sugar embodied a social status of wealth and power. As the lower classes began to develop a preference for sugar through sweetened tea, a marked increase in sugar production in the mid-seventeenth century resulted in a 70% reduction in the prices of sugar. Consequently, cheap sugar became readily available to even the poorest within Britain. Perhaps the most crucial supplement to the working class diet, cheap sugar redefined the lower-class diet. Sweet pastries, porridges, and treacle—a type of spreadable molasses—became dietary staples for the poor and provided a large allocation of their daily carbohydrates, and thus calories. As a consequence of Britain’s cross-class taste for sugar, the market for the product burgeoned, critically driving changes in Britain’s social structure. Demand for sugar consistently pushed the limits of supply. Economic and political forces “supported the seizure of colonies where cane could be grown and raw sugar manufactured, as well as the slave trade that supplied the needed labor.” (Mintz, 167) Thus, investment opportunities in slave trade, shipping, plantations, credit against which plantations and stocks of slaves and sugar could be collateral, and retailing and refining proliferated. (Mintz, 168) By the mid-17th century, the sugar trade was a critical factor in cementing the power and the wealth of the British empire. Further, because the nascent sugar industry in England did not exclusively reward the rich—it provided opportunity to anyone ready to bear the risk, the craving for sugar quite literally fostered democracy, as it transformed England from a status based medieval society to a capitalist and industrial society. 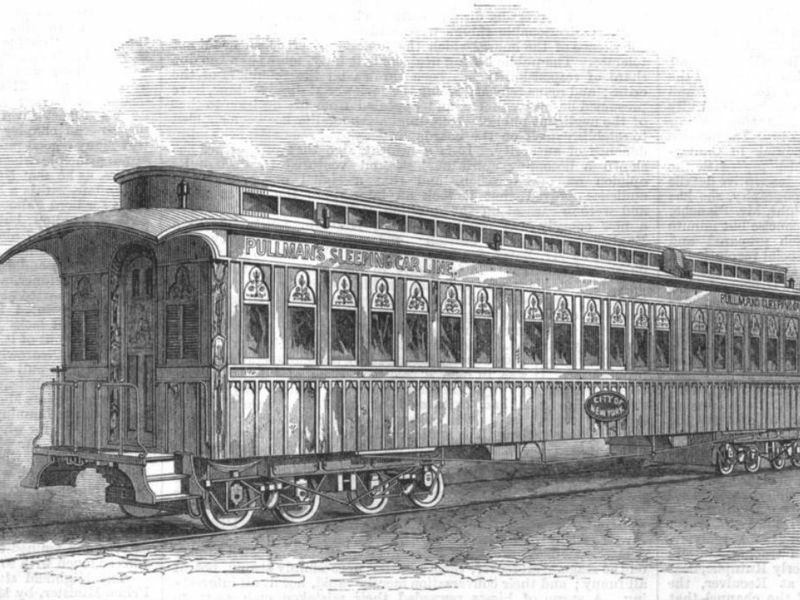 (Mintz, 186). Sugar, a now ubiquitous additive, changed the fortunes of many in Britain over a two hundred plus year span. Culturally, at its nascent usage beginning in the 17th century its association with tea begot a new category of meal for the working class; it supplemented a precariously unstable dietary situation; and ultimately, it provided a not inconsequential catalyst to the development of the British economy via the colonial growth and trading required to sate the country’s desire for sugar. The craving for sugar also fostered an emerging democracy in Britain, and helped lift British society from a social structure grounded in medieval hierarchies to a capitalist and industrial society. (Mintz, 186) Predicated on a deep gluttony for sugar and the capitalistic requirements to provide product, British social norms also changed as the country moved away from a cultural, feudalistic, structure which prevented opportunities for economic mobility to one driven by capitalism, and ultimately meritocracy and democracy. Sugar, in British history, represents more than an innovation in nourishment. The proliferation of sugar as a core food item characterizes the development of the British economy via colonial growth and trading, and the growing power and changing societal norms of the British empire. The following essay is fashioned on the classic 1958 Leonard E. Read economic treatise, I, Pencil: My Family Tree, as applied to the early 20th-century cacao trade of England. In his essay, Read details a global trade system from the point of view of a playfully personified pencil, detailing the “millions of hands” who contributed to its “edification” (Read). While its confectionary predecessor reflects several elements of the modern pencil manufacturing process, components of the former system, especially the cornerstone input of forced labor, undermine the credibility of capitalist admirations of the trade and ultimately serve as an expose of the malice of the chocolate production system. I am a piece of chocolate – the ordinary delicious chocolate familiar to all boys, girls and adults throughout England (Mintz 187). You may wonder why I should write a genealogy. Well, to begin with, my story is interesting. And, next, I am a mystery taken for granted by those who enjoy me, as if I came from the Cadbury plant by accident, with no background. As if I always existed as this square treat, waiting in Birmingham for a chance to meet you (Satre 15). My story begins deep in the forests on the island of Sao Tome (Satre 32). Here, in this pristine panorama off the west coast of Africa (pictured right), the tree of my primary ingredient, theobroma cacao, takes root. A fickle specimen, my cacao tree requires meticulous care, attention, and skill to bear her fruit (Coe and Coe 19). Once tended to correctly, I am born of her warty-edged pod, plucked from her branches, separated from my kin, and left in the sun to transform and become more suitable to your tastes (Coe and Coe 17-30). But my seeds are not the only input so callously cultivated. Of the hundreds of hands who play a role in my fruition, no story is more tragic than that of the man who toils at my roots. This man, like the seeds he nurtures, has been forced from his home in Angola, separated from his kin, and exposed to the scorching tropical sun – to meet your tastes (Martin 55). He receives no wages, inadequate food and no possibility of freedom (Higgs 141). Instead, he is afforded a lifespan of “3½ to 4 years” and, ultimately, “skeletons and shackles” (Satre 22). Unsurprisingly, the name Sao Tome has become “synonymous with okalunga – hell” (Satre 9). Leaving hell, I travel to England aboard a trading galley to meet sugar from the Caribbean and others from across the globe. Most of these ingredients harbor similar tragic geneses, but together we will combine our dreadful beginnings to resemble the shape you hold so sweet (Mintz 55). Most remarkably, we enter the luxurious “model village” Cadbury plant at Bournville. The irony in this juxtaposition is palpable: Bournville, complete with “shops, recreation facilities, garden allotments, a school, and a lecture hall,” could not be further removed from bleak Sao Tome (Satre 15). In this factory utopia, dozens of specialized workers ensure that I am properly ground, pressed, milled, sieved, mixed, kneaded, refined and conched (Martin). And finally, I emerge the bite-sized square of bittersweet joy in your hand. As you can see, hundreds of hands willingly participate in my great journey across the globe. But my story is not one of free market triumph. Instead, it is a tale of corruption and exploitation. The forced labor underpinning my production negates the very system you ascribed to as you purchased me this afternoon. As Mintz argues, “a human being is not an object, even when treated as one.” We should, therefore, return to that “absolutely essential ingredient for freedom: a faith in free people” (Read). I, Chocolate, am a complex combination of miracles. I merit your wonder, awe, and concern. Higgs, Catherine. 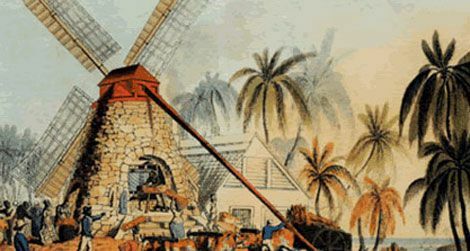 Chocolate Islands: Cocoa, Slavery, and Colonial Africa. Athens, OH: Ohio University Press, 2012. Print. Martin, Carla. “AAAS E-119 Lecture 5: Popular Sweet Tooths and Scandal.” Cambridge, MA: Harvard University. 2016. Lecture. Read, Leonard. “I, Pencil: My Family Tree.” Irvington-on-Hudson, NY: The Foundation for Economic Education, Inc, 1958. Pamphlet. Satre, Lowell J. “Chocolate on Trial: Slavery, Politics, and the Ethics of Business.” Athens, OH: Ohio University Press, 2005. Print. Globalization has created incredible challenges for modern marketing, as companies must win over new markets that feature the unique tastes and desires of a different society. When we take a look at how chocolate is marketed and sold in both American and Chinese drugstores, we can analyze how the stores display the chocolate products. Through this analysis, we can also realize how those reflect the social perception of chocolate in each country, in turn directing how those changing perceptions turn around and drive the marketing, thus creating one large feedback loop. In this analysis, we will examine the displays that sell chocolate in one Harvard Square branch of CVS and compare that with chocolate displays in a parallel store in Shanghai, China called FamilyMart. To set the scene for our argument, we will begin with a basic overview of the two stores and their respective displays. CVS is the second largest pharmacy chain the USA, after Walgreens; in Harvard Square alone, there are two branches opened. Taking a look at the display of chocolate in newly opened branch on JFK Street, we can see that chocolate is sold throughout the store, with one primary area for most of the chocolate being sold. 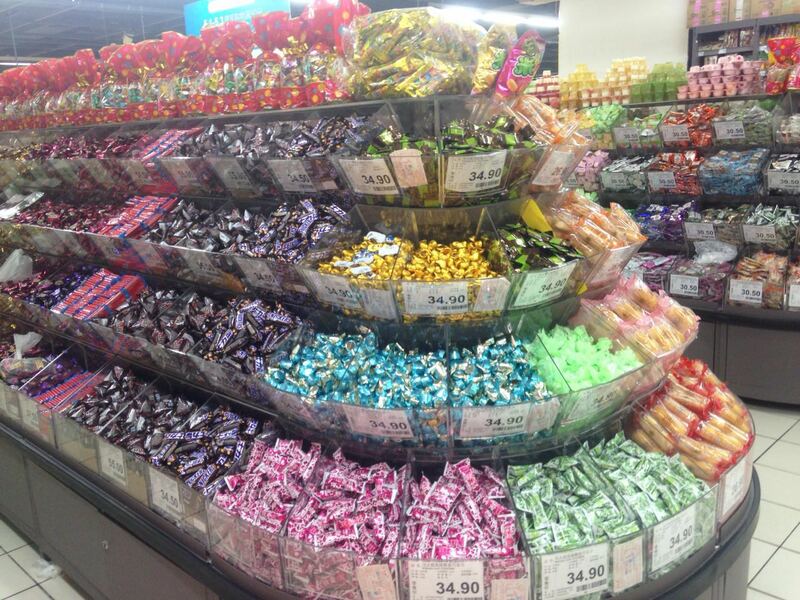 The standard bulk chocolate is sold clumped together in one aisle, with various other candies and sweets, while the “Premium Chocolate” display is placed at the end of that aisle. Most readers will be familiar with CVS, but not so much FamilyMart. FamilyMart is in fact a Japanese convenience store that has flourished in China, where there are currently 1,235 stores in operation, and it can be considered a Chinese equivalent to CVS. In this Shanghai franchise of FamilyMart, we can see that chocolate is also being sold in two sections, but with significant differences in strategy. Instead of choosing bags of prepackaged chocolates, customers can instead choose their desired amount of snack-sized mass-produced chocolates (like Snickers, M&Ms, or Chinese brands) and buy that amount for a price based on the weight of chocolate. These bins stretch down the entire aisle; the shelves on either side hold the prepackaged gift-type chocolates, bars, and even displays devoted to entire brands. With the scene set for the two drugstores in the United States and in China, we can begin to examine the specific strategies used to create those displays and how they reflect each country’s habits and perceptions of chocolate. There are two important aspects of these displays that we can focus on: the chocolate and its packaging, as well as the context of the displays themselves. The assortment available in the regular chocolate aisle of CVS is what one would expect of any American retailer, with all the “big chocolate” players trying to assert their presence. Often, there will be yellow stickers to indicate special deals resulting in astoundingly low prices associated with a huge variety of products. This can only speak to the power of multinational corporations, which is reflected in their ability to produce and distribute millions of pounds of chocolate worldwide. 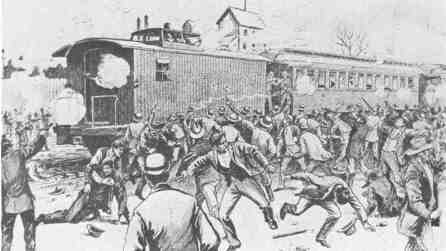 This ability, as detailed by anthropologist Jack Goody in Industrial Food, is mainly due to improvements in mechanization and transportation in the Industrial Revolution of the 1800s. Coupled with this technical revolution of mass production was the increased volume of trade, and as a result, retailers are able to provide many of the same products worldwide. As a result, in the Chinese counterpart to CVS, we can see many of the same goods: M&Ms, Hershey Kisses, Ferrero Rocher. In that sense, the variety of goods that companies are trying to market do not vary much, and so they do not have to create entirely new marketing strategies for a completely different set of products. However, in the clash of cultures that is “East Meets West”, companies must tackle the task that comes with marketing to Chinese consumers. China is one of the most famous cases of growing globalization and capitalism: reforms in the 1980s shifted the Chinese economic structure from communalism to a market-based economy, and according to the World Bank, over 500 million people have been pulled above the poverty line with GDP growth rate averaging around 10% yearly. With this quickly growing economy and a population of 1.3 billion, China became the popular target for the big chocolate companies. Access to this market has not been easy for many of the companies, and these companies have had to come up with new strategies from those used in the United States to break into the Chinese market. Thus, when we take a look at the packaging, we can see obvious differences that show that these companies are reacting towards the different perceptions that Chinese people hold about chocolate. The first main difference is that in CVS, the bulk chocolate is already packaged in bags of about ten to twelve ounces for consumers to buy. As mass production become increasingly easier for companies to use, the West saw that “choices to be made about eating…are made…by what are perceived as time constraints” (Mintz 202). Americans began prioritizing the convenience of food and snacks, and so these packs are ready-made with a variety of products for customers to grab and go. In American society, the “experience of time…is often one of an insoluble shortage, and this perception may be essential to…the principle of ever-expanded consumption”(Mintz 202). As people in America feel increasingly pressed for time due to the pressure to do more and be more successful, these conveniently packages have unconsciously driven the mass consumption of chocolates, which in turns fuels the support for selling chocolate in such method. In other words, the packaging in CVS showcases the American impulse of buying chocolate on a whim, often to self-indulge themselves with large quantities of chocolate, which only reinforces that particular marketing strategy. Contrast this to the packaging in FamilyMart, which reflects the more careful and thoughtful selection of Chinese consumers. Customers instead get to scoop their own bags and combinations of chocolates. This Chinese strategy of selling snack-sized chocolates has a much more practical air, in that customers can pick exactly how much of what they want to eat without the trouble of having to buy at least ten or so ounces of it. This process of selecting their chocolate and having it weighed, similar to how one would buy chocolate or candy from a specialty store in the United States, requires more upfront investment in the purchase, perhaps due to an underlying purpose of gift giving. Gift giving itself is an act that requires much more thought and preparation, and the importance of gifts is a Chinese cultural code that successful companies have recognized while marketing in China. While the bulk chocolate can be catered towards someone’s particular tastes for chocolate, other products on the FamilyMart shelves can be seen packaged very ornately to leave a positive impression upon receipt. The M&Ms are packaged in the fun shape of the M&M mascot and even with a gift inside, while the Dove chocolate has been placed in a respectable tin. In fact, Mars has adopted this tactic of appropriate packaging rather well, and the commercial below is just one example that reflects Mars’ overall strategy of emphasizing the appropriateness of Dove chocolate for a gift. This commercial is the second of a two-part series of ads that focuses on the same actor and actress. The smitten man brings chocolate to the door of the woman he pursued in the first installment, and gives it as a gift of his season’s greetings. She shares the chocolate with her friends and then coyly asks him to bring another box just for her, and so the commercial ends on a promising note. We could also examine this ad for the way it plays into stereotypical gender roles and associations with chocolate, but will instead keep the focus on the action of gift giving. This ad targets the gift giving aspect of Chinese culture incredibly well, giving the audience positive images of love and associating that with Dove chocolate. As Professor Martin discussed in lecture, Mars has been able to win over the hearts of Chinese consumers more successfully than the other companies, simply by showing a distinguished knowledge of and dedication to Chinese consumers. After analyzing the product availability and packaging in each of the stores, we can also look at the particular placement of the displays themselves within the store. 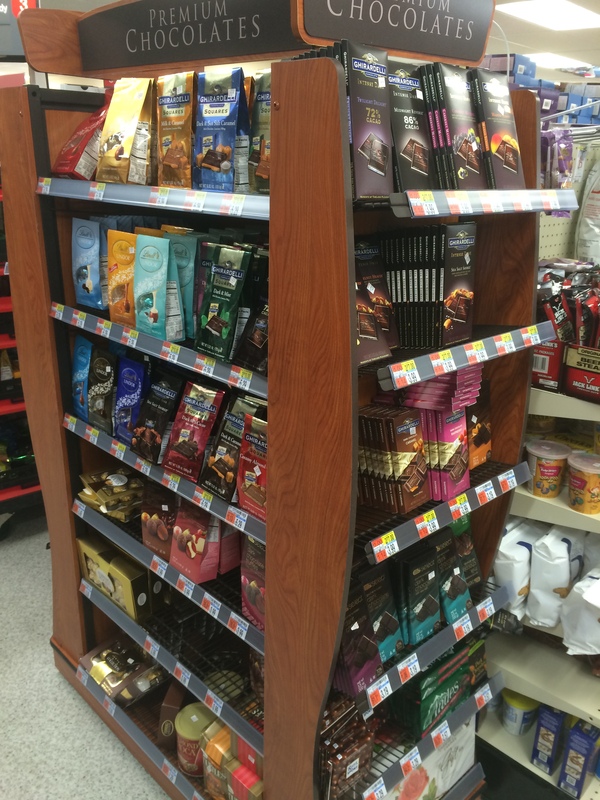 As described earlier, CVS has most of its chocolate in one main aisle with the “Premium Chocolate” display labeled as such, and at the end of that aisle. This has several effects, the first of which is the mere placement of more chocolate at the end of one aisle. Because customers only pick an aisle if they know the product is in that aisle, they are more likely to walk past all the ends of the aisles. Having chocolate on the end of the aisle thus promotes its visibility in the store and entices people to pick up some “premium” chocolate, in this case various bars and packages of Ghiradelli, Lindt, and Ferrero Rocher. In the case where they prefer other kinds of chocolate, they have still been distracted by the mere image of chocolate and are then pulled into the aisle in search of the chocolate they want instead. 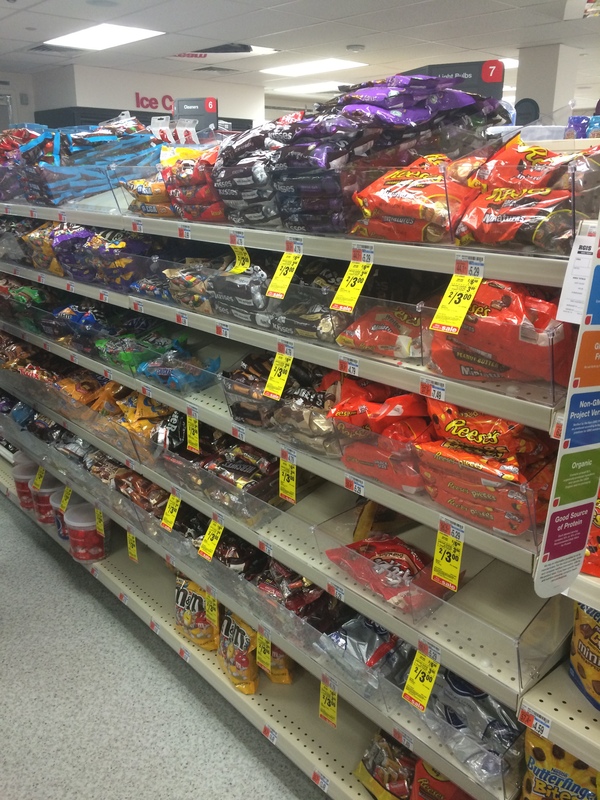 In this particular CVS, and most American stores in general, there chocolate and candy even at the counter, which has the same effect of distracting the customer and relies again on the impulse and self-indulgence snacking tendencies that Americans tend to display. This snacking tendency actually has been seen as a historical trend away from full and separate meals, to smaller snacks in between main mealtimes. The French anthropologist Fischler, “appalled by the way “snacking” has supplanted meal taking…raises questions about the trend toward desocialized, aperiodic eating” (Mintz 212). This tendency is so common and has become so ingrained in our diets that it aligned perfectly with Western packaging of chocolate in convenient grab-and-go sizes. Mintz further goes on to say that today one might sense the “quickening of such diffusion, a speeding up, even in large, ancient societies that were apparently once resistant to such processes, such as China and Japan”. In FamilyMart too, there were small packets of chocolate at the register for people to glance at and perhaps buy to snack on. However, the mass of the chocolate in FamilyMart was deep within the aisles of the store. The pictures have shown the large self-scoops of mass-produced chocolate, as well as the shelf displays of more nicely packaged chocolate. These displays were on either side of the bulk chocolate, and although it makes sense at first to group all the chocolate together, seems to have other effects. In order to look at those chocolates, customers must literally turn their backs on the bins in order to look at the shelves. This causes a literal separation between the two types of packaged chocolate, which directly contrasts with the placement in the American display. 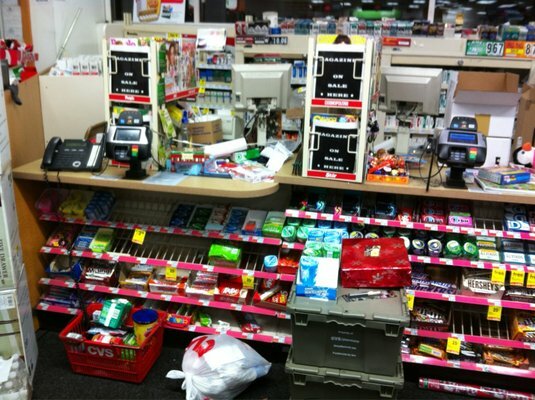 The chocolate in CVS at the end of the aisle drew the customer in, whereas the bins are what will catch the Chinese consumer’s eyes and potentially keep them there and cause them to be completely distracted from the contents of the shelves. How then, can chocolate companies be so successful with the ornate packaging in FamilyMart that is actually rarely seen in generic drugstores like CVS? This apparent contradiction can be explained through the perception of chocolate in China and the nature of the consumers’ purchases. We have also explained the impulse buys that mark American purchases, and contrasted that with the gift-oriented purchases of the Chinese. The separation of the shelves and the bins push this explanation even further, in that Chinese consumers must truly have given genuine thought to the idea of purchasing chocolate as a gift rather than whimsically deciding to buy it for someone after seeing it. After all, the likelihood that they look at the shelves is very low when the large bins of chocolate capture their eyes first. Even when consumers buy chocolate as gifts in CVS, it still may be marked by impulsive tendencies merely because their thoughts have been primed by the image of chocolate. 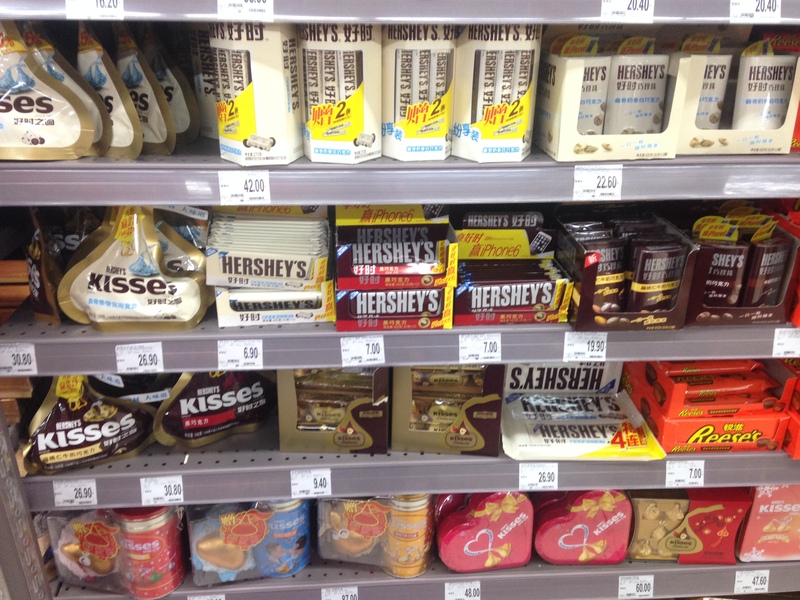 The placement of certain chocolate on the shelves was further emphasized by flashy displays. 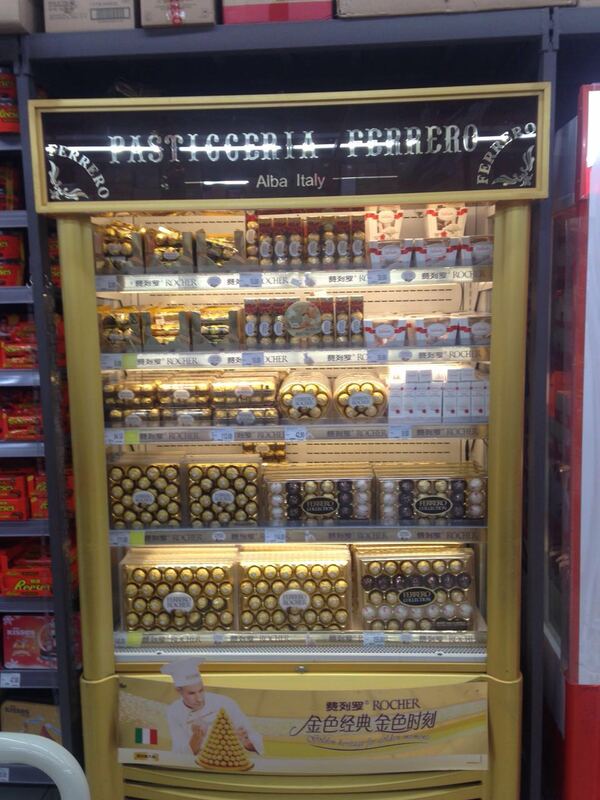 Of particular mention were the following two displays for Ferrero Rocher and Kinder. These displays were of particular interest due to the fact that Mars has been so successful relative to the other chocolate companies in China. Ferrero, another of the big five companies, owns these two brands. As a matter of fact, Ferrero has carved out its own “niche in China by taking the path of least resistance” and successfully employing tactics aimed at the Chinese culture of gift giving. In Chocolate Fortunes, Lawrence Allen tells of how Ferrero “successfully sold the Chinese people on its delicate, foil-wrapped hazelnut treats”, using its foreign and exclusive image to promote the value of its chocolate as a luxury gift (Wharton article). Thus, placed in this historical context, the display in FamilyMart of Ferrero with its predominantly gift-oriented goods and personalized spotlights makes complete sense. With this explanation, the other display of Kinder chocolate then seems somewhat of an anomaly, since the packaging looks too simple to mark the goods as gifts. We often do not see Kinder chocolate in the United States; the CVS in this comparison certainly did not sell Kinder products. The reason for its presence and marketing is in fact driven by another aspect of Chinese culture – that of the value placed in children. The marketing of this product was likely developed through the social valuation of children in Chinese culture, and the parental desire to raise successful children. In the following ad, the mother has prepared Kinder chocolate for the children when they say that they want to eat something tasty. The chocolate is further described as having the nutritional value of a large glass of milk within the bar, and the children are shown playing outside happy and healthy. These images really draw on the parents’ desires to have similarly happy and healthy children, and so Ferrero demonstrates truly effective marketing that plays on aspects of Chinese culture that Mars does not. Following the examination of chocolate displays in an American CVS and a Chinese FamilyMart, we can see that both the variety of goods, their packaging, as well as the environment of their displays all reflect the societal perceptions of chocolate. These in turn show how each culture has particular values that are played upon by chocolate companies in order for them to successfully sell their product; and in doing so, these chocolate companies further reinforce the same habits that then continue to draw sales of chocolate. Yet in the Chinese market, we can see two divisive approaches that sell chocolate: one approach sells chocolate in customized bulk purchases of snack-sized chocolate, while the other approach leads to elaborate packaging the name of gift giving. These approaches, although both effective thus far, are signs that Mars has perhaps a slippery hold on the Chinese market for chocolate. There remains still an enormous amount of potential in a market of this size, and through the continued, careful analysis of Chinese culture, any company can emerge successful in the years to come. 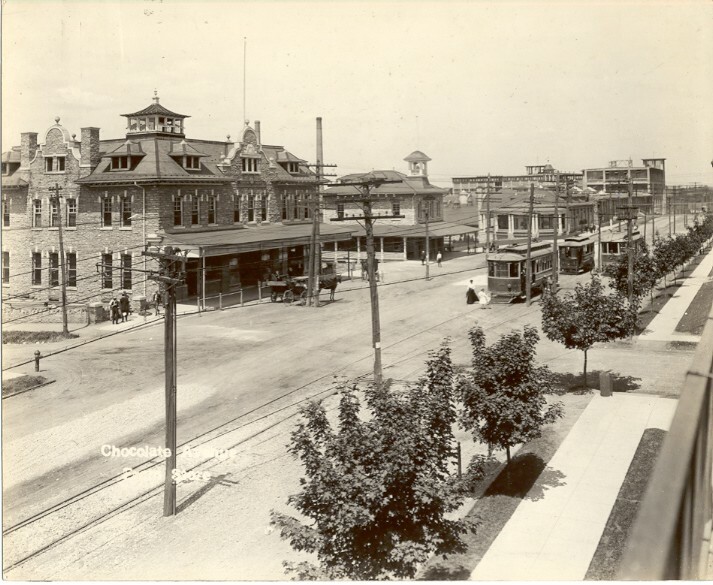 Allen, Lawrence. 2010. Chocolate Fortunes: the Battle for the Hearts, Minds, and Wallets of China’s Consumers. pp. 1-39, 201-224. 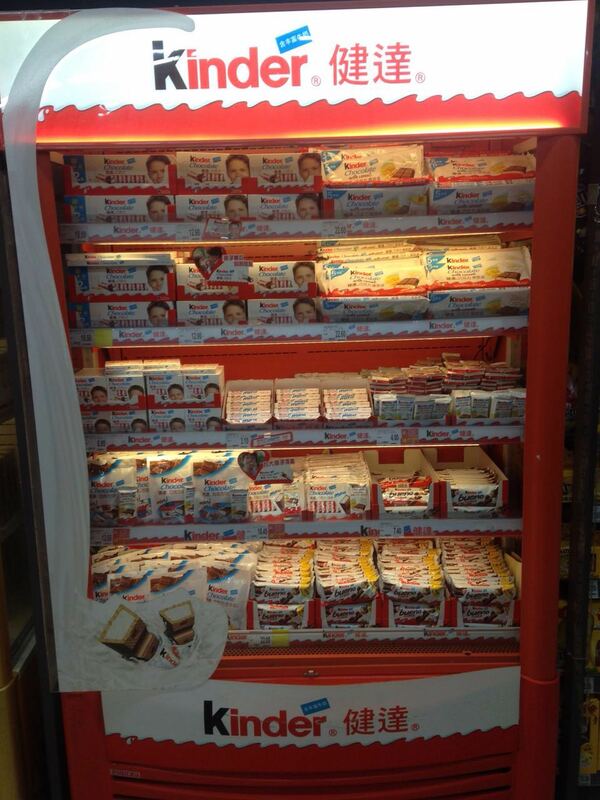 “China Kinder Chocolate TV Commercial Ad.” YouTube. YouTube, 14 Jan. 2014. Web. 1 May 2015. “China Overview”. World Bank. Web. 1 May 2015 <http://www.worldbank.org/en/country/china/overview#1&gt;. Dove Chocolate ad in China. N.p., n.d. Web. 2 May 2015. <http://static.youku.com/v1.0.0529/v/swf/loader.swf?VideoIDS=XNDgzMjMxNDg0&embedid=NjUuMTEyLjguMjA3AjEyMDgwNzg3MQIC&wd=&vext=pid%3D%26emb%3DNjUuMTEyLjguMjA3AjEyMDgwNzg3MQIC%26bc%3D%26type%3D0&gt;. 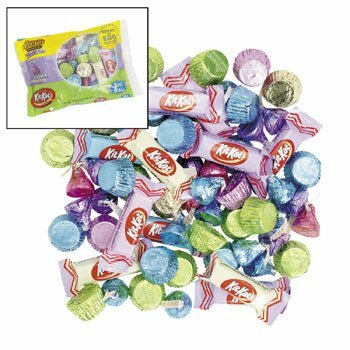 Hershey’s Spring Assortment, Easter Candy & Chocolate. Digital image. Amazon. N.p., n.d. Web. 2 May 2015. 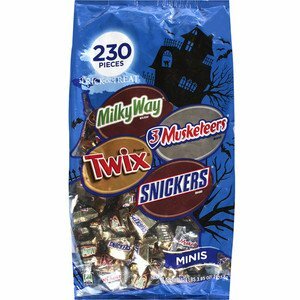 Mars Halloween Assorted Chocolate Trick-Or-Treat Candy Mix. Digital image. Amazon. N.p., n.d. Web. 2 May 2015. “Oversea Business: China.” FamilyMart. Web. 2 May 2015. Website gives stats on the number of FamilyMart franchise stores currently in China, as well as the store logo.